READING, PA — “Gary Erbe: 50 Year Retrospective,” viewing through Aug. 5 at the Reading Public Museum, is a national exhibition touring throughout 2018. It also has made its way through the Butler Institute of American Art in Youngstown, Ohio, and the Brinton Museum in Big Horn, Wyoming; it will end at the John F. Peto Studio Museum in Island Heights, N.J.
Erbe is internationally recognized for impeccably painted iconic images of Americana and memorabilia. He has exhibited extensively since 1970 with solo shows at museums and galleries throughout America, Asia and Europe. He is represented in numerous private and public collections, including the Phillips Collection in Washington, D.C., and the Philadelphia Museum of Art, among others. Erbe’s compositions ultra-realistically portray objects such as loaves of bread, a collapsible Polaroid camera, a tennis racket, books and shelving, as well as a plethora of knickknacks. The entire compositions of these still-lifes are tilted straight up and forward, like a tray held against the back of a television screen. The memorabilia are arranged collagelike on the canvas surface and explore a wide range of familiar subjects; the golden age of television, sports, popular cartoons, classic Saturday matinees and social commentary. Considering the level of skill seen in these works, it’s amazing that Erbe is self-taught. Enhanced by strong shadows and contrasting light, the effect is a pure three-dimensional trompe l’oeil (“fool the eye”) illusion. In 1967, Erbe discovered this style of painting and studied its masters. Shortly thereafter, he invented a manner of painting that elicited a contemporary departure from traditional trompe l’oeil creations. 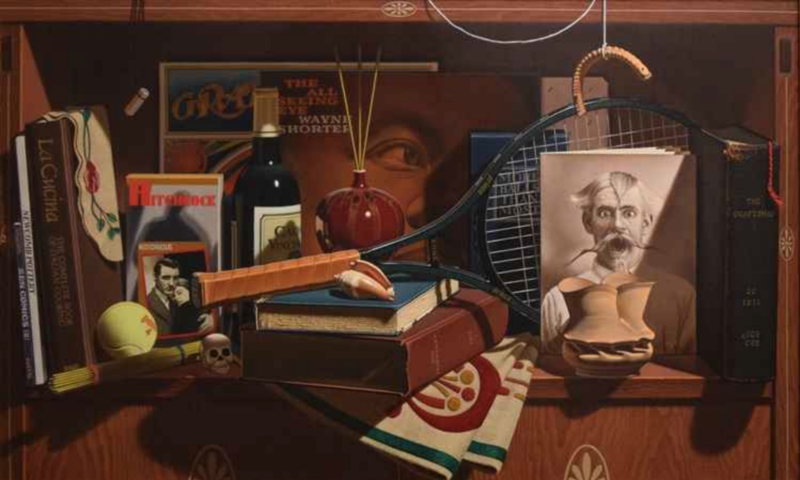 For instance, a painting titled “Art, Craft and Leisure” offers a cluttered bookshelf, crowded by a wine bottle, a tennis racket, assorted books and a vinyl LP of jazz artist Wayne Shorter. Another work, titled “Levitated Tabletop Composition,” consists of a tabletop still life with an uncut loaf of bread on its surface, along with a ceramic bowl partially filled with eggs, a few cupcakes and a single yellow rose placed in a thin vase. Oddly, the tabletop and contents are floating in midair, like a magic carpet flying through an indeterminate gray space. Erbe often refers to his paintings as “levitational realism” and utilizes this motif throughout the exhibition. Stylized, nostalgic, surreal at points, these paintings are evocative of the memento mori, a meditation on things that have passed into personal history, like a forgotten drawer stuffed with old tickets, a single glove, postcards and such. Surprisingly realistic for more than a few, the images seem to project from the surface of the painting. His goal, however, has less of an interest in creating a convincing illusion in favor of challenging the perceptions of the audience. © 2019 John F. Peto Studio Museum. A Non-Profit 501(c)(3) organization. All Rights Reserved. Design by Woodhaus Studio LLC.